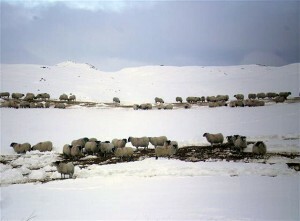 The Scottish Tenant Farmers Association has called upon landlords and their agents for a rent standstill to allow tenant farmers to recover from one of the most challenging years in living memory and a rent rebate for hard pressed livestock farmers who have experienced enormous difficulties and incurred substantial losses during the recent prolonged snow storms. In a letter to Scottish Lands and Estates and to major firms of land agents, recently appointed STFA Chairman Christopher Nicholson said that tenant farmers have been hard hit by the unbroken bad weather over the last twelve months which has resulted in disastrous harvests for arable farmers, fodder shortages and increased costs for livestock farmers. This has all conspired to put great strain on farming businesses, which has now been compounded by the ravages of recent prolonged snow storms and a late spring. He went on to say: “I believe that it would be in the spirit of the landlord/tenant partnership and entirely appropriate for you, as landlords, to agree not to pursue tenants for rent rises this year. The stresses and strains of trying of survive under difficult farming conditions will only be exacerbated by rent reviews in the next few weeks. A moratorium on rent increases for 2013 would allow tenant farming businesses some time to recover from the effects of last year and to make plans to adapt to the challeges of climate change and the likelihood of continuing extreme weather patterns as well as making provision for reduced direct support under CAP reform. Christopher Nicholson from Wigtownshire has recently been appointed to the post of Chairman of STFA, succeeding Angus McCall who has been in the post since 2004. Christopher farms the family farm Kidsdale near Whithorn in Wigtownshire where he runs 110 suckler cows, broiler breeder units and grows 720 acres of cereals. He has been a director of STFA for seven years and vice chairman for the last three. Christopher has also been chairing the NFUS Tenants Working Group for the last two years.